The Ontario Immigrant Nominee Program (OINP) allows the government of Ontario to nominate individuals for immigration to Ontario. The OINP is one of the most varied and dynamic of Canada’s Provincial Nominee Programs (PNPs), with streams and categories designed to welcome skilled workers, graduates, and business immigrants. Proposed amendments to the Ontario Immigration Act may lead to significant changes to OINP streams. To many people, Ontario is the crown jewel in the Canadian landscape. This gigantic province, located in east-central Canada, is home the country’s largest city, Toronto, the national capital, Ottawa, and a host of other cities, towns, and communities that have welcomed newcomers from around the world for many decades. But how to get there? Apart from the federal programs, such as the programs managed under the Express Entry immigration system, Ontario immigration authorities also offer unique pathways to Canada. In some cases, applicants to the OINP may be in the federal Express Entry pool. Indeed, the OINP currently includes three Express Entry-aligned streams. In these cases, an OINP provincial nomination leads to the applicant receiving 600 additional Comprehensive Ranking System (CRS) points, with an invitation to apply (ITA) to follow soon after when Immigration, Refugees and Citizenship Canada (IRCC) conducts a draw from the pool. 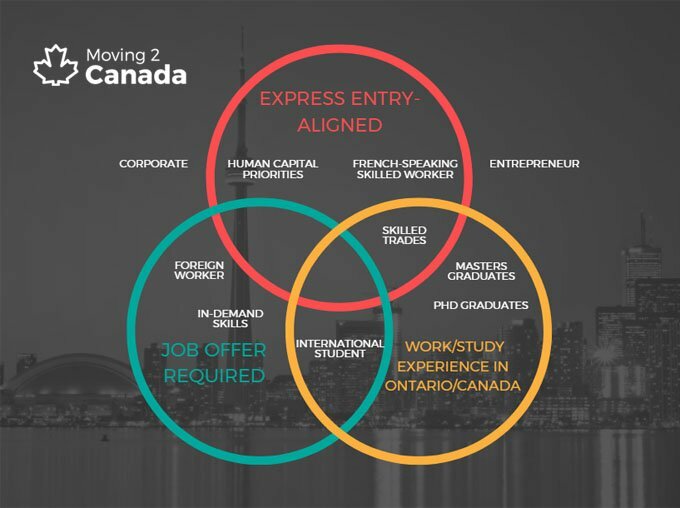 The Express Entry Human Capital Priorities Stream has proven to be particularly popular since being introduced in 2015. There is also a French-Speaking Skilled Worker Stream, for Express Entry candidates with ability in English and French, and a Skilled Trades Stream, for Express Entry candidates with experience working in a trade in Ontario. In other cases, applicants can arrive in Ontario via the OINP having never gone through the Express Entry system. International students and graduates benefit from streams aimed at targeting newcomers with various levels of educational attainment. Finally, there are streams that focus on welcoming individuals and companies with business experience. With years of experience, the team at Toronto-based consultancy Doherty Fultz can help you discover your options and plot a pathway to PR. The following table shows the range of immigration streams and categories operated by the Ontario immigration authorities. Click on any item in the left column to learn more about that particular stream or category. Foreign Worker Yes Have a permanent job offer in a skilled occupation that meets the prevailing wage levels in Ontario for that occupation and region. As the table above shows, the OINP is a highly varied Canadian immigration program containing multiple streams. Some of the basic information may also be presented in a diagram. You can find out which OINP streams are open right now, in our PNP Canada Live Tracker. Do you need assistance in preparing an application for Canadian permanent residence? If so, view Moving2Canada’s Book an Immigration Consultant page to see our list of recommended, accredited representatives who can assist you in your goals. If you plan on settling in Ontario’s largest city, Toronto, you can also join the Moving2Canada New in Toronto Facebook Group.